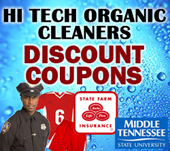 Hi Tech Organic Cleaners is one of the largest independent dry cleaners in Murfreesboro, TN and currently services a growing number of corporations, office buildings and hotels with daily and weekly delivery service. Dry cleaning service has become a popular employee benefit by offering time-saving convenience to employees. Employees simply place their dry cleaning into our valet bags and leave them in the designated drop-off/pick-up location for us. We'll pick up orders and deliver them back professionally cleaned, perfectly hung or folded, and ready to wear. Signing up is easy and our service is non-intrusive; there is no need to disturb individual employees who leave clothing for cleaning. Again, no order is too small and we are probably already picking up and delivering in your geographic area.